AS OF DEC 10, 2018 WE WILL NO LONGER ALLOW SMOKING ON THE OUTDOOR DECK. 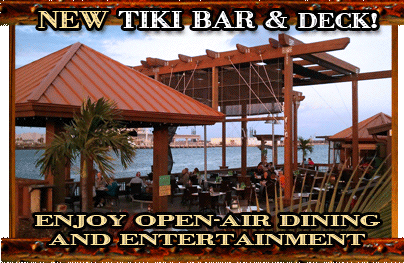 WE WILL ALLOW SMOKING NEAR AND AROUND THE TIKI BAR. THANK YOU ! Welcome to Rusty's Seafood and Oyster Bar, located in the beautiful waterfront harbor of Port Canaveral! A "come as you are" family restaurant where you can enjoy the cozy southern feel of dining inside, or on our outside patio overlooking the water. Sit at our full service inside bar and enjoy the friendly bartenders while they shuck you fresh oysters. Rusty's has 42" flat screens and other various tv's that play water related video entertainment. There is always something for the whole family to watch. We always have a fun and friendly atmosphere that will put a smile on your face. Rusty's isn't just a place to come and eat, but also a great location for holiday parties or any special event. Dive into our raw or steamed oysters, peel-and-eat shrimp, seared ahi tuna, buffalo wings, snow crab legs, a hearty bowl of our seafood or clam chowder. Wash it down with a pitcher of ice cold beer or your favorite cocktail, ice tea or soda.